At age 21, Colin Hancock is making serious waves in the early jazz community. Hancock, now in his junior year at Cornell University, discovered the music of Bix Beiderbecke and the magic of hand-cranked phonographs at an early age. His fascination with old jazz records and the machines on which they were played was no passing childhood fad; his musical and mechanical interests, encouraged by his parents and teachers, persisted and intensified. He received formal lessons on string bass and trumpet from Dan Torosion, John Moon, and Martin Norgaard, some true veterans of the Austin music scene, but went on to teach himself all the other major band instruments “through hours and hours of trying to get the right note and trying to do what was on these recordings that I really liked.” Some of these instruments came easily; others, like the clarinet, were more difficult to master. “It took a very long time,” he says, “to be able to sit in with ensembles and get gigs as a clarinetist.” From strings to reeds to rhythm instruments, he has become a true multi-instrumentalist. Hancock’s determination to master a band’s worth of instruments says a lot about his ability to solve problems most would write off as insurmountable. It was, he says, “out of necessity…I wanted to hear what it would sound like if these ideas I had were played by a group.” He told himself, “no one in my age group can do this so I’ll do this and be able to put these ideas on a recording.” He started making multi-track recordings of himself playing each part on early jazz tunes while he was in the fifth grade. His parents, in addition to supplying musical instruments, found him antique acoustic recording equipment. By his early teens, he had acquired everything he needed to make original acoustic recordings on wax cylinders. He found a “shaver,” used to scrape a cylinder clean for a second take, being sold as an antique sewing machine. During his freshman year Hancock was hauling his equipment around town to make cylinder recordings of his friends and of the high school band. His experience multi-tracking allowed him to create cylinders of himself playing each part of jazz recordings. Some of these may be heard on YouTube at SemperPhonographCo, where, along with the many non-cylinder multi-tracks he has created, one may find other notable jazz-related projects. These have only gotten better as he has traveled and recorded with other fine musicians around the country. By high school Hancock had developed a gift for recruiting people to help him realize his musical ideas. He made contact with musicians in his community, including veteran drummer Hal Smith, who urged him to embark on what became known as “The Buddy Bolden Project.” He brought together a band and research team that included Smith, David Sager, serious classmate musicians, and the music director at the school, Mark Kazanoff. After researching early recording techniques they re-enacted an imagined lost Buddy Bolden recording session. Some of the cylinders he created during this period are now in the cylinder collection at the University of California at Santa Barbara. So he arranged a meeting with Paul Merrill, the music director of the jazz program, to express his frustration and share his fear that his ability to play the music he loved might suffer for lack of group practice. Trusting the organizational ability that Hancock had already demonstrated the director gave him the space to create an early jazz band at the school along with some leads to area musicians who might lend him support. Finding like-minded students to join the band was easier than it had been in high school, in part because his fellow musicians shared his interest in the academics of his projects. “The process of learning that style of music required them to listen to the old recordings. So that then to go back and recreate those recordings in the way they were made was a fascinating experience.” At last he had found a new venue to combine his interest in hot jazz with his interest in early recording techniques. He organized The Original Cornell Syncopators to commemorate an important moment in recording history—the day in 1917 the Original Dixieland Jass Band set up in a New York studio to cut what are said to be the earliest jazz sides. Hancock scheduled a concert for the anniversary date, then a year away, and began to build interest by sending fliers to bands in cities throughout the region. He reached back out to Hal Smith and David Sager who had aided the Buddy Bolden Project. Smith, he says, “has always been my main mentor in early jazz. The person I trust with everything in the music business.” Hancock works to maintain these relationships; Sager has visited with the Syncopators in Ithaca as recently as last fall. Hancock added several new mentors to act as “coaches from afar.” While still in high school, he had met and played with Dan Levinson and Janet Klein at an antique phonograph show in California (where he was visiting his friend, collector and historian John Levin), so he contacted both Levinson and Klein for this project. Knowing of Levinson’s Roof Garden Jass Band, which has a focus on the very earliest jazz, Hancock found him uniquely positioned to advise the Cornell Syncopators on tackling ODJB material. Their local “coach” was Joe Salzano, a veteran in the Western New York jazz scene. The process of preparing for the concert proved to be an education for the new five-member student ensemble and Hancock himself refined his thinking about how to approach playing early jazz. “At first,” he said, “we tried to fake book/real book parts for the Original Dixieland Jass Band music and that just got us nowhere. Then I did a few semi-transcriptions but not completely exact transcriptions because I didn’t want to be a band that read transcriptions down pat. That seemed wrong, that didn’t seem like it was honoring the music for what it was, when in reality a lot of these songs were just memorized by the ODJB. So we had these weird transcription/head sheet things and then we actually started to develop as a group and learn the music. The Cornell Syncopators have a standing gig at a local restaurant lined up this spring. Membership has grown to a full thirteen musicians, credited in various combinations on their new studio release, Wild Jazz. The album was recorded on one mic with the band carefully positioned to create the authentic sound of early recordings. Selections moved beyond the ODJB to unearthed obscurities and an Arcadian Serenaders cover to commemorate their San Diego festival debut. I asked Hancock for advice on building a hot jazz community wherever you may be. He says the two keys are nurturing connections and using local history to your advantage. To encourage local interest he has researched the extensive ties between Cornell and the New York City jazz scene of the 1920s. He has also discovered bands, such as The Cornell Collegians, who were doing back then what the Syncopators are doing now. Knowing history has a way of turning the incurious into boosters of their surroundings. I can easily picture whole generations passing through that frat house unawed that a 1924 Louis Armstrong had played there. After hearing the Original Cornell Syncopators, this generation anyway, will understand and proudly share the story with new members. He also recommends reaching out to the living history that can be found in every community if you scratch the surface. The Syncopators have made many connections to people who played with Spiegle Willcox, trombonist of the Jean Goldkette Orchestra, who lived right down the road in Cortland, New York. The other thing, and it should be obvious, is to play out. By playing everything from swing dances to pool halls you create an acceptance of early jazz as part of the local scene and an expectation for it that will draw in more musicians. Colin Hancock will be building connections in Italy this spring on a semester abroad. But he is coming back to Cornell in March to meet Wynton Marsalis for an afternoon workshop with the rest of the Syncopators. He is eager to show Marsalis what the Syncopators have achieved toward mastering the early 20th-century music he loves. “We want to make the right impression,” said Hancock. 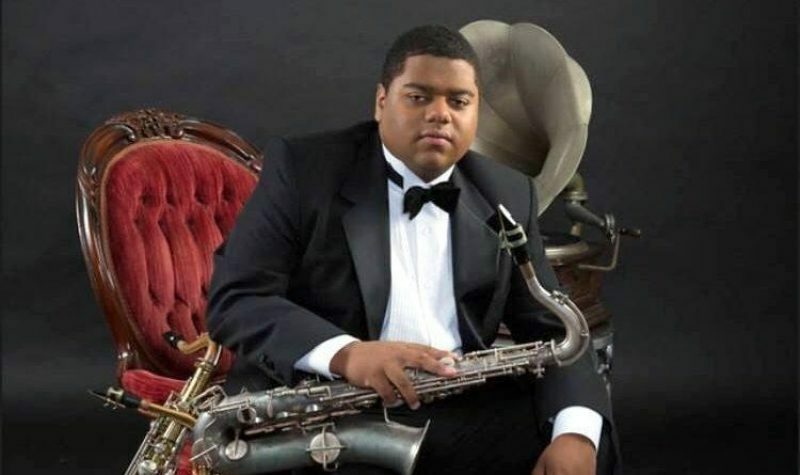 After graduation in 2019, Hancock will be off to law school following the venerable tradition of jazz musicians with impressive day jobs. He will continue to play and no doubt there will be opportunities everywhere for a young man who has already shown that he has what it takes to be a leader—in a band and in the community at large. The Original Cornell Syncopators will stay on as a permanent part of the Cornell jazz program, a legacy ensuring future students with an early jazz interest will be taken seriously. Making acoustically recorded 78 rpm discs at commercial scale and pressing them on authentic materials is admittedly a steep challenge. Hancock concedes that there are daunting physical and financial obstacles to overcome before the plan is viable, but if ten years from now I find myself cranking up the Victrola to hear a new hot band straight off the presses I’ll know that Colin Hancock has done it again.